You might check Sheldon Brown - I believe he has a seat post size chart on his site. I'll measure the diameter of mine (1970 UO-8; should be the same) when I get home. Mine has neither a size nor a safe insertion line stamped on it. Do you have the shim which fits into the seat cluster lug? I just checked; the seatpost of my 1970 UO-8 is 25.6mm, which makes sense for a straight-gauge steel frame with a French seat tube outer diameter of 28.0mm instead of the more familiar 28.6mm. Mine does take a thin OEM cylindrical steel shim at the binder bolt. I showed up at a local church sale one day and 10 minutes late. Five nice bikes where being loaded on top of a mini van, most likely to be put in a container and sent back to the purchaser's homeland. But there were two bikes left in their wake, one of the bike's color scheme caught my eye, Black, Lime Green and Purple. Upper midwesterners are swaddled in this color scheme from craddle to grave, Artic Cat snowmobiles. Other posting tell more about the specs of the bike but none mention a three speed freewheel(ATOM) and the tiniest derailer I've ever seen that my find has. Heres a bit of history I discovered that same day while reading No Hands, The Rise and Fall of the Schwinn Bicycle Company, An American Institution(Crown and Coleman, Henry Holt and Company, New York, Page 132). It was discussing Bevil Hogg a co-founder of Trek. "The child of a civil engineer who worked throughout Africa building roads, Hogg as a teenager moved to Europe to study in Switzerland and France. He started an import-export company and moved to America during the bike boom to sell French cycles. After some minor success, he was introduced to a company in Minnesota that had made a fortune selling snowmobiles. Seeking to diverify the seasonal business, the company ordered a shipment of bikes in the unlikely colors of chartreuse and purple. Hogg says he had the dubious task of selling the models to North Woods snowmobile dealers with beaver pelts on their shop walls. "They looked at me pretty blankly." The chartreuse bikes didn't sell, but he earned enough cash to open his shops." I just picked this bike up for $130. It's in great shape, and is a high quality bike. Problem is I have no idea what it is. The headbadge says "topeka schwinn". The top tube has a "vitus" decal. Dura ace 7401 rear derailleur, Dura ace hubs, front derailleur, shifters, brake levers. Shimano 600 headset and crank. The handlebars and stem probably aren't original. Tubular wheels, Wolbler profile 20 (profile 18 front) rims on dura ace hubs. The numbers under the bb shell read "E080525. It also has a fancy stamped "CLB" and the word "Brevel" under the bb shell. There are more words, but they are underneath the cable guide. I'll take that off in a bit and figure that out. The crank has the letters LL stamped, indicating a 1987 year if the crank is original. Does anyone have any idea what this bike is, and what year it is? also approximate value would be great. Didn't Vitus make aluminum frames as well as steel frame tubing? Is this aluminum or steel (magnet)? I just bought a like-new condition, black with silver lettering, 14 speed, chrome-moly 52CM frame, Schwinn World Sport bike. It also says "Made in China" on the frame seat post and the head badge says "Schwinn Quality"
I was wondering what year it was made and how much it weighs. I looked online and found a forum with scanned pages of actual Schwinn catalogs from 1979 to 1989 and could not find the bike. There were "World Sports" but their descriptions didn't match my bike's. There may be a date code stamped on the head badge. It would be a 4-digit number. I think the 1st 3 digits are the Julian day, the last digit is the year. Many of the components also have date codes on them - so that would also help to determine the year. If you can post a picture of it - someone could probably help narrow it down. Why don't you just step on the bathroom scale and weigh it? The mfr's weight claims are always lies anyway. I don't think it can be much older than mid-80s with a 7-speed freewheel. Thanks for the input, Gralyn and David! After much research and help from two other forums I post on, I found out that I have a 1990 World Sport was made on the 191st day of July (which would be the 10th), in the year 1990 as the "1910" stamp on the bike's head badge would indicate. It has the original 14 speed gearing with index stem mounted shifters. I also found that the advertised weight for this year of Schwinn World Sport was 26 pounds. I just added some toe clips and new Schwinn racing seat and now I am happily biking along! 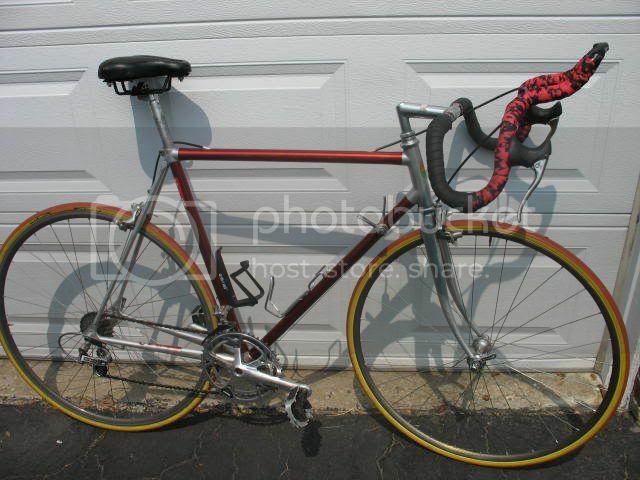 Here's a larger picture of my 1990 Schwinn World Sport, before the installation of toe clips. My brother-in-law found it on Craiglist for $80 and was able to bargain down to $40! My LBS did not find any major problems with it and after changing the rear knobby tread tire to match the front smooth tread tire, a minor tune up and a general cleaning up by me, which did not take long because it was already in greta condition, this is how it looks now. I have the same bike But black with turquoise lettering. i was given a pair of bicycles by a 87 year old bicycle collector and ive searched the web and cant find another tebag. there is a reference to a swiss racing team. they are city bike 3 speed internal hubs, with generator light systems, built in locks without the keys, ornate paint around lugs. nice bikes, fair condition. any ideas what they are? no pics yet. thanks, john and josh.